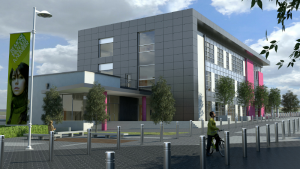 BSE 3D worked alongside the design and build team over two phases to construct a state of the Art Science, Technology, Engineering and Maths learning facility and special Learning Difficulties and Disabilities facility including a Hydrotherapy Centre. Both buildings were constructed on the existing Isle of Wight College site as part of the college’s ongoing improvement works. Both buildings have been designed and constructed to be energy efficient, using a wide variety of technologies available to achieve the the A16 Energy performance rating, and BREEAM Very good for the STEM building. Contributing to the buildings energy efficiency is high performance heat recovery ventilation units, VRF air conditioning with heating recovery to increase the performance of the hot water generation system, with a large Photovoltaic Array mounted at roof level. Decentralised plant allowed for better performance on the ventilation plant equipment and reduction of ventilation rates controlled via CO2 sensors in each room. High quality LED lighting with daylight dimming and absence detection also played its part in reducing the buildings electrical loads. The STEM & SLDD opened to new students for the 2015/2016 academic year. For more information contact the team by filling in the form below.